Nokia’s entry level Windows Phone 8, the Lumia 620 underwent a disassembly courtesy of the folks at WindowsMania.pl in Poland. Their breakdowns are straight forward and provide a nice overview of the components without getting too technical. It will not surprise you to learn that the Lumia 620 does not reveal anything earth shattering. Of the Windows Phone 8 devices, this is colorful and affordable device offering the "Nokia experience" that all Lumias apart from the other Windows Phone 8 devices. Things are rather well organized, just like its two bigger cousins. The tear down follows WindowsMania’s normal method. The display has two distinct parts, presumably to make it easier to replace parts if something breaks. One might take note of the dual microphone set-up as well. Since none of us are in the habit of disassembling our devices, it is always interesting to see what is inside. Be sure to zoom in on the pictures to see more detail where you can. Yeah! If Lumia sales go very well then they can take back crown of most units shipped back from SS. Including the Asha lineup tbh. WP has a bright future but let's be realistic, it'll take its time to grab considerable market share. yeah..take it back from Sammy B*tch..!! Desperately waiting to buy this phone! I'll order it the instant it goes for sell. Would have loved the 920, but at my current state of Job it'll cost too much. I'll just start saving for next gen of 920 (940?) while make an entry to WP world with the 620! 820 will cost me 2x of 620 price. I can add that money into my L940 funds! Nokia is a beast and you know it!!! 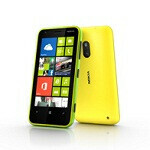 Lumia seems nice, but its success could be damaged by sub-average battery. I'm also not sure about the quality of the display. PA, i'm waiting for the review... It looks delicious! It's funny when I think that the most affordable windows phone 8 smartphone is costlier than Nexus 7.